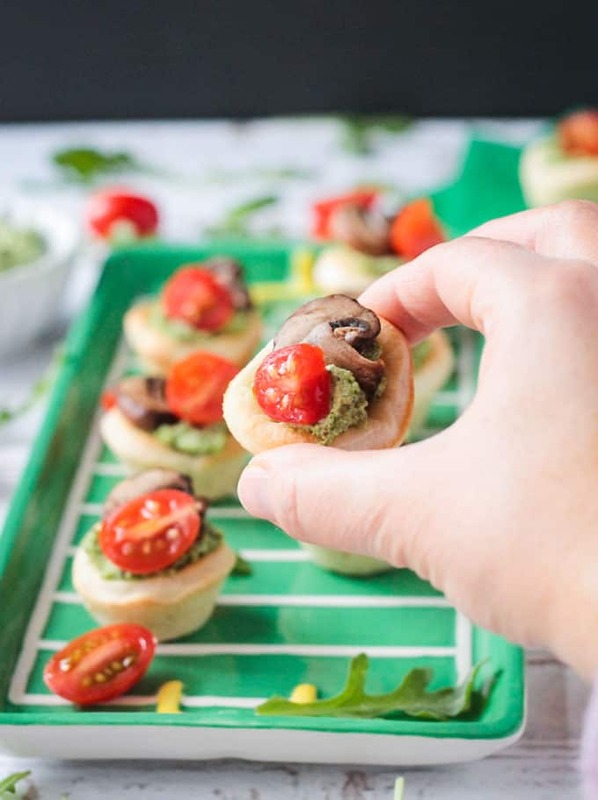 Pizza Bites – Big bold flavors in a little bite – perfect for your next party or get together! Kids and adults alike love these little bites! The Big Game is fast approaching. 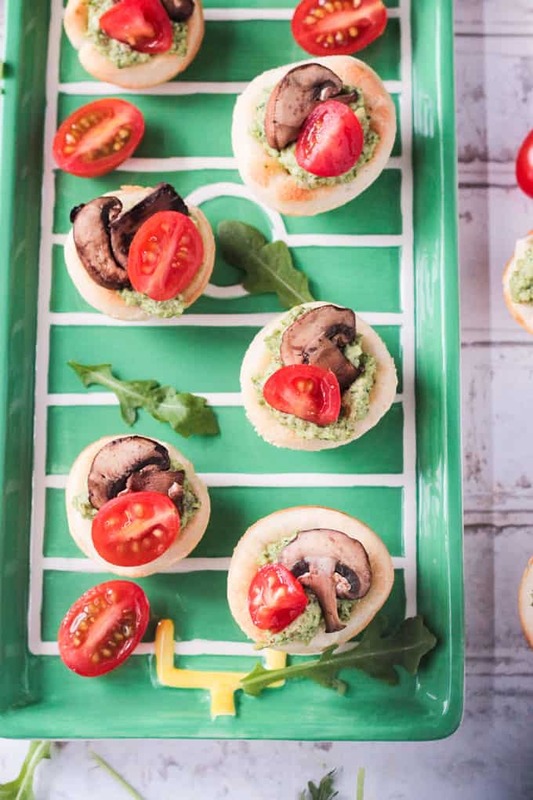 What yummy eats are you planning on munching on while watching all those great commercials…er, I mean, touchdowns? Personally, I think you should put these Vegan Pizza Bites on your menu. They are seriously delicious!!! 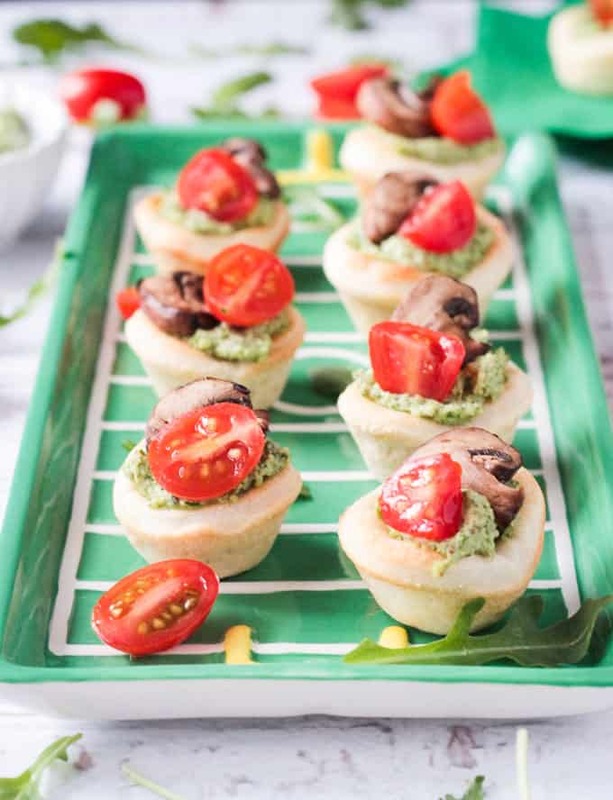 The combination of flavorful pesto, sautéed mushrooms, and fresh cherry tomatoes in a crispy little pizza dough cup….it is the PERFECT bite! The girls and I may have eaten an entire batch for lunch yesterday. 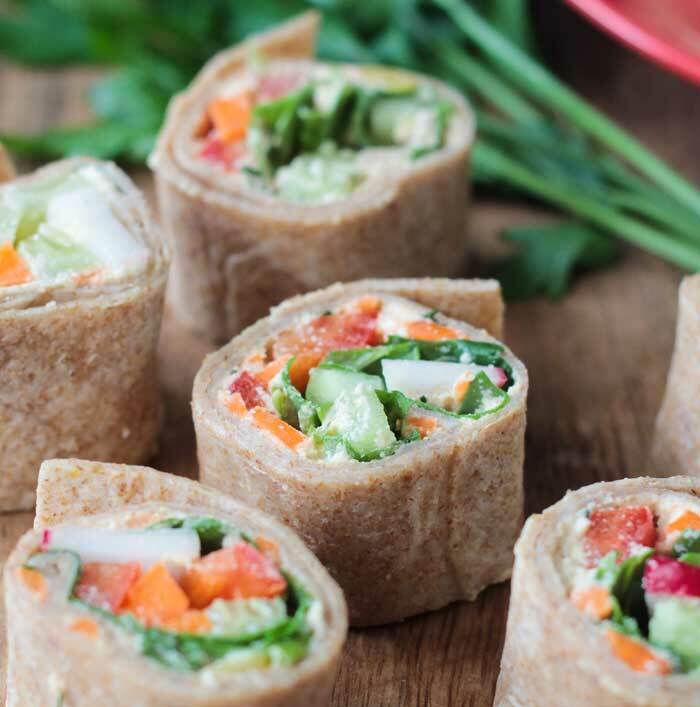 I got the idea for this recipe when I saw the Hummus Cups from Inspired Taste. They looked so cute and I loved that they used store bought pizza crust to make things super easy. I kept the crust the same, but changed up the toppings. This recipe uses my Mixed Greens Almond & Pepita Pesto. There is so much flavor here you will NOT miss the cheese on these pizza bites…I promise!! We enjoyed these so much, that I might just have to make a bigger sandwich version sometime. Mmmmmm. I cheated and used a pre-made refrigerated pizza dough. Pillsbury Pizza Dough just happens to be vegan…not exactly healthy, but we aren’t eating these every day. Feel free to use your favorite store bought or homemade pizza dough…bonus if it’s whole wheat. If you don’t want to mess with cleaning your mini muffin pan afterwards or if you don’t have one, you can bake the little dough circles flat on a parchment lined baking sheet instead. Or if you don’t even want to be bothered with cutting out circles at all, these toppings are also sinfully delicious on slices of baguette…kind of like a bruschetta. 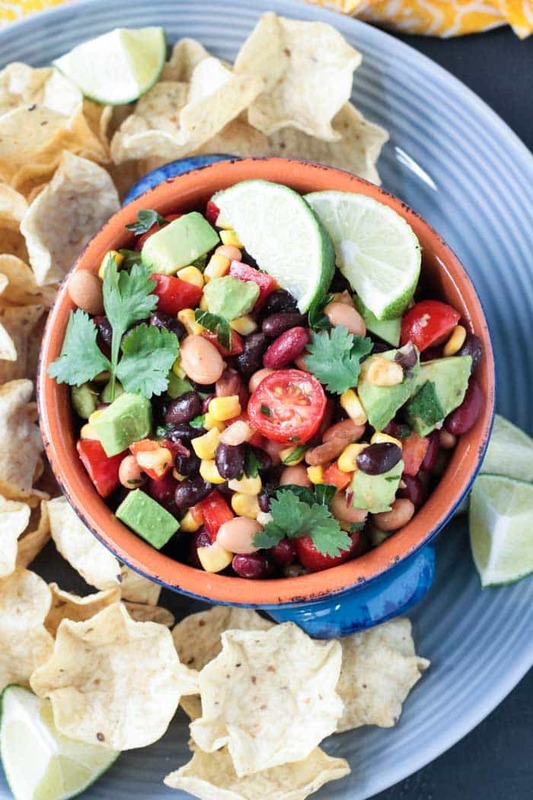 You might want to make a double batch because I guarantee you won’t have leftovers! They are always a huge hit at parties. 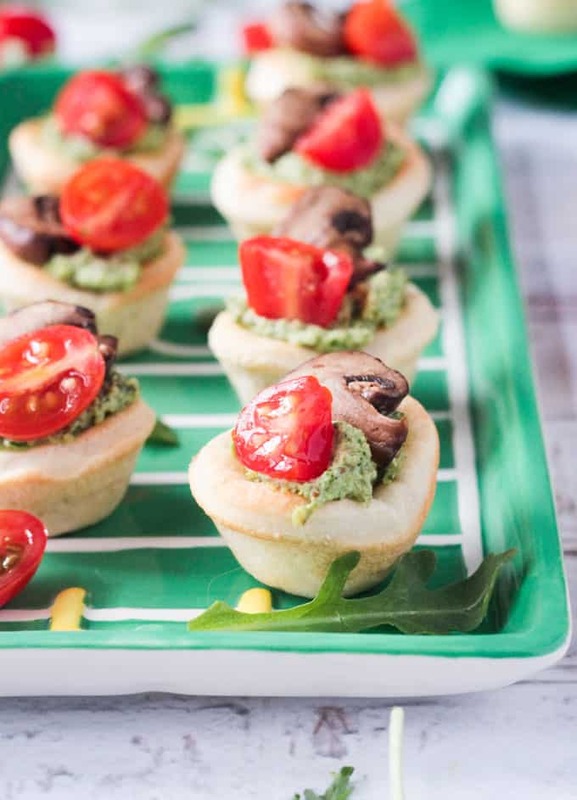 No matter if you are a carnivore, omnivore, or herbivore, you will be loving on these little pizza bites! Kids and adults alike gobble these up in record speed. I hope you love these Vegan Pizza Bites as much as we do. If you try them, please come back and leave me a comment below with your feedback and star rating. You can also find me on social media. Be sure to tag @veggie_inspired and #veggieinspired so I’m sure to see it. Enjoy! Roll out the pizza dough on a clean surface and cut out as many circles as you can using a 2.5 inch circle cookie/biscuit cutter (or an empty clean 4 oz can works really well too!) I got about 15 circles of dough. Press dough circles into a mini muffin pan that has been sprayed lightly with oil. The dough should cover the bottom and sides. Pierce the bottom of the dough with a fork 1-2 times so they don't puff up too much when baking. Bake pizza dough for 8-10 minutes until lightly browned and cooked through. While the dough is cooking, sauté the sliced mushrooms for 3-4 minutes until softened and flavorful. (Mushrooms let out a lot of liquid, so you shouldn't need oil or water for sautéing.) Stir frequently to avoid sticking. When dough is done, let cool for a few minutes. 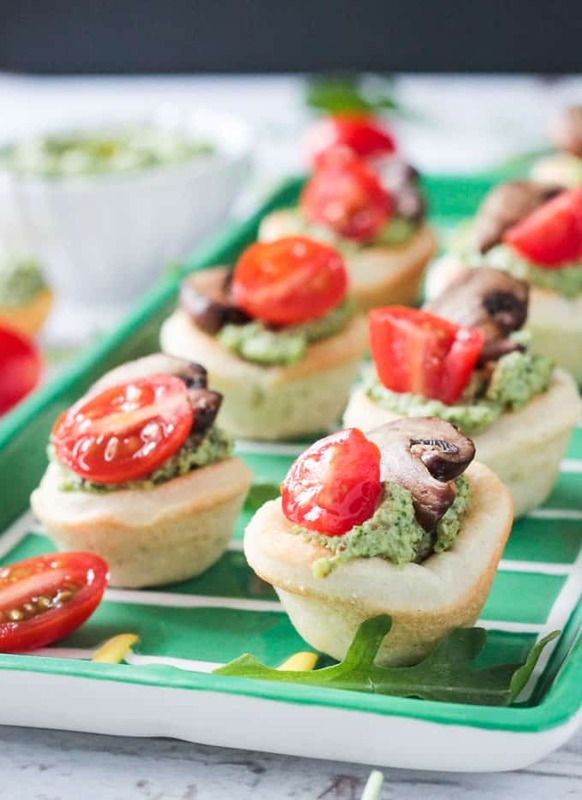 Top each one with 1-2 tsp of pesto, a few slices of sautéed mushrooms and a few slices of cherry tomato. ~Even though you'll only need about 1/2 cup of the Mixed Greens Pepita Pesto., I encourage you to make a whole recipe. Use leftovers on roasted veggies, baked potatoes, stirred into rice or pasta, as a dip for raw crudité or crackers, etc. It's so good! Original posted January 2015. Photos updates December 2017. 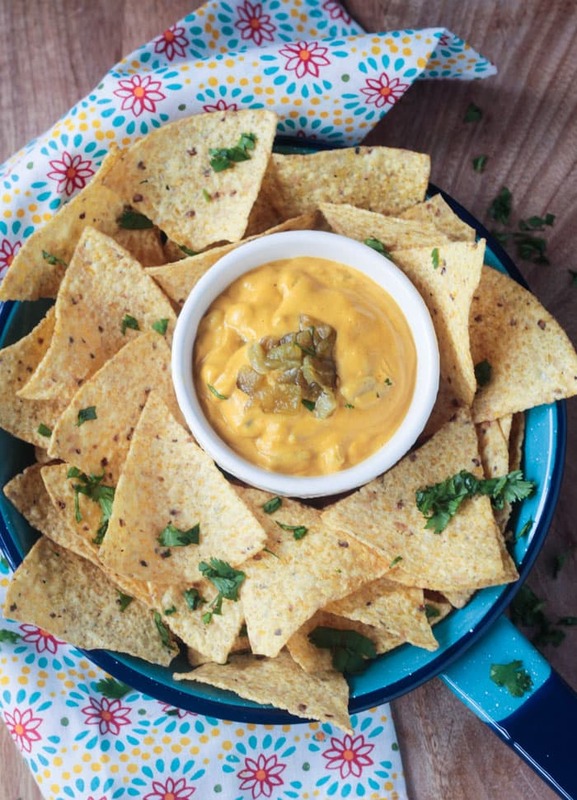 Planning to bring these to a party – they look so good! I will have to serve them at room temp – will they be good that way? Thanks! Yes, definitely! I always serve them room temp! Usually I make everything the day before and keep them all the components separate. Then all have to do the day of is assemble! Hope you love them! Thanks, Aimee!! Pesto is my favorite too! So flavorful! Delicious idea!!! Love these sooo much. Thanks, Trinity!! They are seriously one of my favorite recipes on my blog! Best pesto ever! Definitely will appeal to men too, these are delicious! Thank you so much! I’m so glad you guys liked them! This recipe looks really delicious!